Background: Acute disseminated Encephalo Myelitis (ADEM) is an important neurological cause of mortality and morbidity and many aspects of the aetiopathogenesis and clinical presentation are still not clear. More studies are needed to be continued particularly from developing countries on ADEM. Aims & Objects: To study the clinical spectrum of ADEM in relation to aetiology and neuroimaging study and to compare the findings observed in the other parts of India and abroad. 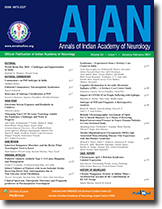 Materials and Methods: Clinical examinations, neuroimaging study and electrophysiological tests and follow up in 62 patients of ADEM in the Bangur Institute of Neurology, Kolkata, India from January 1996 to March 2004. Results: Thirty Four patients (54.83%) were below 20 years. Among the preceding events, presumptive viral infections accounted for 32.25% of the total cases, specific viral infections in 43.54% cases, and sample antirabies vaccinations in 24.19% cases. Myeloradiculitis were the common neuroparalytic complications following semple anti rabies vaccination found in 10 patients and in another 5 post vaccinated patients had multiple sites of involvement. Acute cerebellar ataxia was the common clinical presentation following varicella infection found in 8 cases and another 6 cases had multiple sites involvement. Multimodal evoked potential studies corresponds to the clinical localization of lesions. MRI studies disclosed that white matter lesions were maximum in subcortical white matter and periventricular regions. No signal alterations were observed in 4 cases of acute cerebellar ataxia following varicellar infection and 4 cases of Myeloradiculitis following semple anti rabies vaccinations. Out of 62 patients, 50 patients survived (80.64%), among them 22 patients (44%) had significant motor disability and rest 28 (56%) recovered well in the functional status. Mortality found in the study was in 12 patients (19.36%). Conclusion: Specific viral infections is the common preceding events of ADEM followed by presumptive viral and survivors had motor disability in the 44% cases. The outcome was greatly influenced by antecedent events and number of sites of involvement. Background: Copper ion is a pro-oxidant metal and may be responsible for free radical mediated damage in Wilson's disease (WD). Estimation of serum malondialdehyde (MDA), a standard test to detect oxidative damage, may support this pathogenesis. Aim: The aim of the study was to analyze the serum levels of MDA and correlate with clinical status in patients of WD. Patients and Methods: Forty five patients, from a large cohort of proven WD at various stages of treatment were evaluated. Their clinical parameters were noted and assessment of disability and handicap were done. The laboratory tests were carried out using standard methods. Results: The mean age of patients was 21.1+9.1 years (range: 6-50 years) with M: F ratio of 1.6:1. The mean age at presentation was 14.4+6.9 years (range: 6-42 years) and the mean duration of treatment was 14.4+6.9 years (range: 0-24 years). Their mean serum copper and ceruloplasmin levels were 41.4+22.9 g/d1 (range: 4 -103 g/dl) and 5.8+3.4 mg/dl (range: 2-18 mg/dl) respectively. Thirty eight of them had neurological involvement, four had hepatic form, two had both hepatic and neurological involvement while one was presymptomatic sibling. Patients were assessed using CHU staging (mean: 1.5+0.6), modified schwab and England Activities of Daily Living (MSEADL) scale (mean: 94.44+19.55) and Neurologic symptom Score (NSS) (mean: 3.96+5.2). The mean serum MDA level was 0.65 + 0.34 moles/1 and only four (9.4%) patients had increased levels of MDA (mean: 1.32 + 0.05 moles/1), compared to control (mean: 0.56 + 0.36 moles/1) but it was not statistically significant. No significant correlation was noted between MDA levels and NSS, CHU score, MSEADL score and serum copper level. Conclusion: Increased levels of MDA were detected in only 4 out of 45 patients but those with or without increased MDA levels were not different in their clinical status. These patients were on long term treatment, which might alter the oxidative state. Mechanisms other than oxidative damage may underlie WD. Further studies, especially on newly diagnosed patients, need to be done to validate the mechanism of copper induced damage. Background: Vascular Dementia (VaD) is common, global, disabling and a rather neglected, age related dementia. It is important to identify and treat it since cognitive impairment produces dysfunction in occupational and social life. Moreso, due to increase in geriatric population, incidence and prevalence of VaD is also increasing. Aim: We share our observations on efficacy of Rivastigmine and Donepezil (drugs advocated for improving cognition in dementia) in patients of VaD. Material and Method: This was a non-randomized study based on clinical evaluation. We selected 53 patients suffering from VaD (as per clinical and radiological criteria). Their age range was 55-78 years (mean 65.3 + 6.2 yrs). Clinical, biochemical and radiological (Cranial CT and MRI) evaluation was done to establish etiology. Cognition was measured using modified Mini Mental State Examination (MMSE) which was repeated 2 times, at interval of 3 months. We observed the role of Rivastigmine in 14 and Donepezil in 19 patients of VaD. The change in MMSE score was compared with 20 control patients of VaD. The associated risk factors like hypertension, diabetes, hyperlipidemia etc. were managed. Acetyl Salicylic Acid (ASA) in dose of 150mg/day was given as an antiplatelet agent to all 53 patients in this study. Results: At end of study, no statistically significant improvement was observed in MMSE score in any of the 53 patients. Improvement in MMSE score (though statistically insignificant) was observed with Rivastigmine in 11 and with Donepezil in 14 patients. Progressive decline in MMSE score was observed in 14 (70%) control patients of VaD who did not receive rivastigmine or donepezil. Conclusion - Rivastigmine and Donepezil are beneficial in halting deterioration of dementia in patients suffering from VaD. Parkinson's disease is a distinctive progressive disorder characterised clinically by tremor, rigidity, bradykinesia and postural imbalance. Although James Parkinson himself denied the presence of intellectual changes in the parkinsonian Disease, thorough exploration has revealed behavioural and cognitive changes to be explicit in the patients. India, along with its demographic shift and its overwhelming population growth, falls a victim to all old-age degenerative diseases. A large percentage of the elderly Indian population today suffers from Parkinsonian and related disorders. Disturbed cognition and neurobehavioral abnormalities are enough reasons for a falling ADL (activities of daily living) curve, and consequent distress to families of PD patients. Spontaneous involvement of one and all is required to not only intervene with the right pharmacological therapy, but also to empathize and develop the right attitude towards the affected person. Cognitive dysfunction in Parkinson's disease is well established and its affection in the early stage has been reported. In this article. We attempt to review and update the various cognitive impairments that occur in all the Parkinson related disorders which necessitates diagnosis, management and rehabilitation to alleviate patients' suffering. It also reviews the role of frontal lobe, dementia and depression with respect to these patients. A five-year-old girl manifested with acute relapsing polyradiculo-neuropathy. Elevated cerebrospinal fluid proteins, electro-physiological evidence of conduction block and remitting course suggested possible acquired demyelinating radiculoneuropathy. However, intellectual deterioration during follow up, evidence of extensive, symmetrical and periventricular demyelination on MRI of brain and metachromatic on sural nerve biopsy led to the diagnosis of metachromatic leukodystrophy (MLD). Inherited neuropathies such as MLD may occasionally present atypically in the early stages. Recognition of this variation has considerable therapeutic and prognostic significance. Twenty three mentally retarded adults affected with epilepsy and institutionalised in a home were managed by us for more than 2 years. The peculiarities of the epilepsy and the various difficulties confronted while treating them are documented. All of them were retarded since birth or early childhood and dependent for guidance on the caregivers for self care and other day today activities. 1) A mixture of atonic and genralised tonic clonic seizure was observed in 22%. 2) Sixty nine percent had at least one attack of GTCS per week. 3) At the end of 2 years of adequate treatment 48% continued to have breakthrough seizure once in 2- 4 weeks. 4) Behaviour disorder was noticed in 65% (15) initially and with the control of epilepsy forced normalisation occurred in 33% (5) of them. The caregivers played the vital role in (a) identifying the type of seizure (b) administering the drugs regularly in spite of several difficulties and (c) observing as well as informing the physician about the adverse effect of the drugs and changes in the behaviour early. For successful management of mentally challenged epileptic adults, a well co-ordinated effort by both the physician and dedicated, knowledgeable caregivers is essential.